With the transportation sector overtaking power generation as lead emitter of CO2, the Port Authority must include tenants and customers in its 80% by 2050 pledge greenhouse gas reduction goals. The Port Authority was founded a hundred years ago to coordinate travel between New York and New Jersey. If it is to continue for the next hundred years, it must accept the challenge of climate change, and to coordinate the states’ transition to sustainable modes of transportation. A correlation has been established between the rise of temperatures and CO2 levels since the 1950s6. So too the expansion of Port facilities and the growth of air and automotive travel across the region – which speaks to the PA’s wherewithal to influence tenants and customers. In December 2015, then-PA Chair John Degnan declared environmental concerns “incidental” to the Agency’s transportation mission.11 His timing was unfortunate. 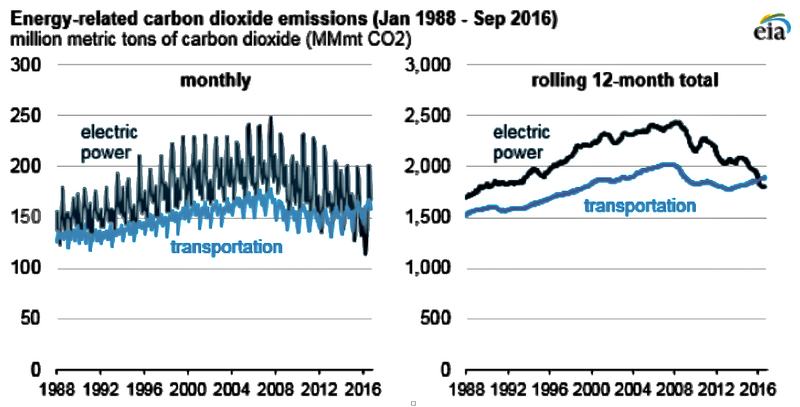 In 2016, greenhouse emissions from the U.S. transportation sector surpassed power generation for the first time since the 1970’s. Over the coming decades, the states have committed to significantly realign their transportation priorities to meet their 80 by 50 obligations. So must the Port Authority if it is to remain a relevant player.